Bright, modern, cosy one bedroom apartment. Amazing views of the Castle from the building's walkways. Situated in the heart of old historic Edinburgh within walking distance of all city centre attractions. Just 2 minutes to the bustling Grassmarket with it's quirky boutiques, restaurants and bars. Well equipped kitchen and very comfortable bed. Sleeps two in the king sized double and a third person on a sofa bed in the lounge. High chair and cot available on request. Hello, I am Lynne and have lived in Edinburgh off and on for 25 years. I started self catering holidays for my own family when they were small, and loved it so much, I decided to offer it here in Edinburgh. The Grassmarket is a great location in the Old Town of Edinburgh. Close to quirky boutiques, owner managed coffee shops and restaurants, many bars, a Farmer's Market on Saturdays and all in the shadow of our iconic Castle, the area is quite simply stunning. The open plan living area makes the apartment very socialable and a comfortable, cosy place to start and end your busy day of sightseeing. The bathroom has a shower, toilet and hand basin. Soap, shower gel and shampoo are provided. Towels are also provided except for a face cloth or sponge for personal use. The bed is a king size. A third person can be accommodated on a sofa bed in the living room which is 4 ft wide (120 cm) so very comfortable for one. There is a weight limit on this of 14 stone/200lbs/90kg. If two people do not wish to share the main bed, the sofa bed can be made available if requested. There is an additional one off cost for this of £15 to cover laundry and labour. Bath, hand and kitchen towels provided. Please bring a face cloth or sponge for personal use. Tea, coffee, sugar, milk are provided. A dining table faces the window and is open plan to the kitchen and living area. The sofa bed has a weight limit of 14 stone or 200 lbs, 90 Kgs. The apartment building is on a hill and entrance is on the third floor. This apartment is located two floors above the entrance. There is a major building site behind this apartment with a new hotel going up. This work will continue until November 2019. Work is allowed to take place from 7.00 am - 7.00 pm, Mon - Sat within the guidelines set by the City of Edinburgh council. If you are looking for a holiday where you can sleep late, this apartment is probably not for you. However, if you are planning to be up and have full days for sightseeing, it will be perfect. Perfect location. Wonderful decorated and exceptionally clean. The apartment is in a fabulous location to explore the Old City as well as the New Town. Lynne is extremely helpful and replies quickly to any queries, before and during the stay. The apartment is compact, though there is enough room for plenty of luggage and we don't travel lightly. There was a comment in a previous review about the number of steps to the apartment. There are two flights, but if you're staying in Edinburgh, then stairs and steep hills are just part of the deal. The kitchen works well, for preparing meals, everything is there that you need.We'd definitely stay at this apartment again. It was good to have the extra space. Everything worked fine. The only downside was the stairs and a small shower. Good location near a number of sights. Clean, tidy apartment in Grassmarket area. Great French pastries across the street. My daughter and I had a lovely time in this very clean, well equipped apartment. We walked through the old town and all the way to the new town on foot easily. Two minutes from the Grassmarket and two from a supermarket. Very convenient. The only thing that might be a problem - the shower is pretty small so if you are a big person - be aware. 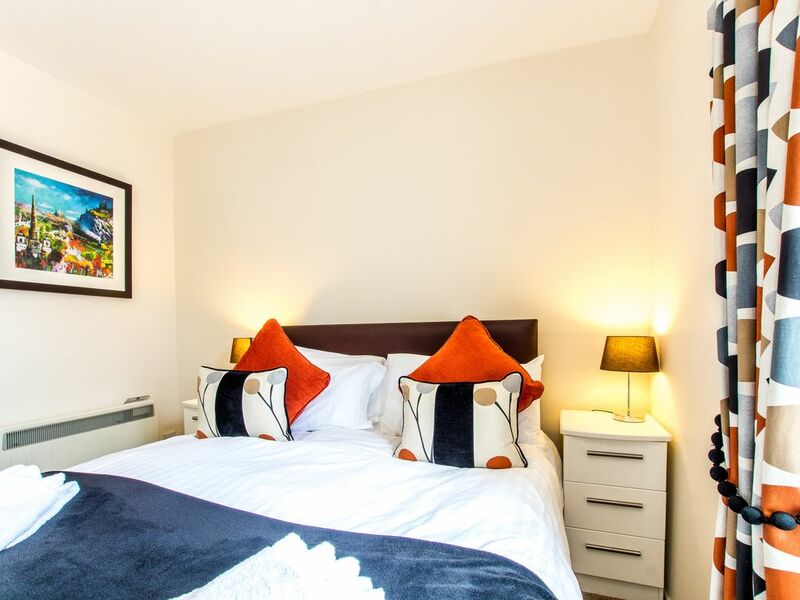 The apartment is in a super central location, just two minutes from the Grassmarket with its cosmopolitan variety of cafes, bars, restaurants and quirky boutiques. A 10 minute walk will bring you to our famous Princes Street and its gardens. Many of the museums, galleries and attractions in Edinburgh city centre and the Royal Mile with the Castle and Holyrood Palace are also a stroll away. There are good public transport links with one bus stop about 10 metres from the building entrance and many more within 10 minutes walk. There is a good supermarket just 5 minutes away with a good choice of food. Every Saturday, there is a Farmer's Market on Castle Terrace where you can buy lovely Scottish meet, fish, fruit and vegetable. This is also a good option for an al fresco lunch. Directly opposite the apartment is The Coffee Mill, run by the gregarious Gino, where you can have breakfast, lunch or tea. And just 5 minutes away is one of the best cake shops in Edinburgh - Lovecrumb. A perfect place for a coffee and cake. Mary's Milk Bar is just down the road with the best ice cream in Edinburgh and for animals lovers, Edinburgh's only cat cafe, Maison de Moggy is also very close.